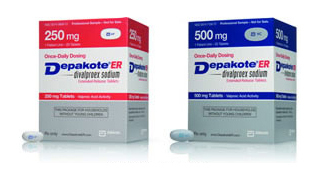 Depakote is available in 125 mg, 250 mg and 500 mg strengths, and can be supplied as Depakote ER (extended-release tablet), which releases small amounts of the medication over a period of time, or Depakote DR (delayed response. ), a delayed release version. Syrups, capsules, and sprinkle capsules that can be added to food are available as well. Depakote works within the brain to stabilize the mood and behavior of the user. While all of these variants are made of the same active ingredient, ER and DR tablets and capsules vary in terms of bioavailability (the amount of the drug that reaches systemic circulation.) In any case, Depakote must be taken under a doctor’s supervision. Mental and psychiatric disorders are the most common conditions that Depakote is prescribed to treat. It has been used to effectively control manic episodes in individuals with bipolar disorder, as well as depressive states in these patients, and is occasionally prescribed to individuals who suffer from major depressive disorder. In the United States, Depakote is also used to prevent migraine headaches and to control seizures in patients with epilepsy. Neuropathic pain treatment is another possible use for Depakote and the medication is being studied for its potential benefits to HIV patients. GABA is an amino acid that serves as the CNS’ chief inhibitory neurotransmitter that suppresses neuronal excitability, resulting in reduced sensations. Because the principal action of Depakote is to boost the action of GABA, it tends to produce a relaxing effect on the brain such that moods, epileptic seizures and Parkinson’s disease, all characterized by overstimulated nerves, are controlled. In the treatment of chronic pain, Depakote also works with GABA blocking the flow of pain signals between the brain and nerves. Depakote is contraindicated against various medical conditions that mostly involve liver, pancreas, kidney and brain dysfunctions, as well as deficiencies of certain biochemicals such as carbamyl phosphate synthetase and ornithine carbamyltranferase. People with blood-related disorders, pregnant women and those who are dealing with depression or suicidal tendencies should also avoid the drug. As it affects the CNS, Depakote should be used under the strict supervision of a doctor, both during and after treatment to prevent withdrawal symptoms. People being considered for Depakote medication should inform their doctors about existing medical conditions they may have which are contraindicated to the drug, including pregnancy and breastfeeding. Children below two years old are particularly at risk for liver failure, especially when they have other medical conditions at the time they are taking Depakote. The drug can also cause withdrawal symptoms when stopped abruptly. Hence, stopping treatment should only be done gradually and strictly under instructions from a doctor.